We started getting a bountiful basket a few months ago and we got tons of carrots, and they were huge, like the size of a butternut squash or over grown zucchini. As I was brainstorming what to make, this recipe came to mind, and I had to get it from my sister-in-law. It was as good as I remembered! My husband, myself, and our little 3 year old gobbled it all up! 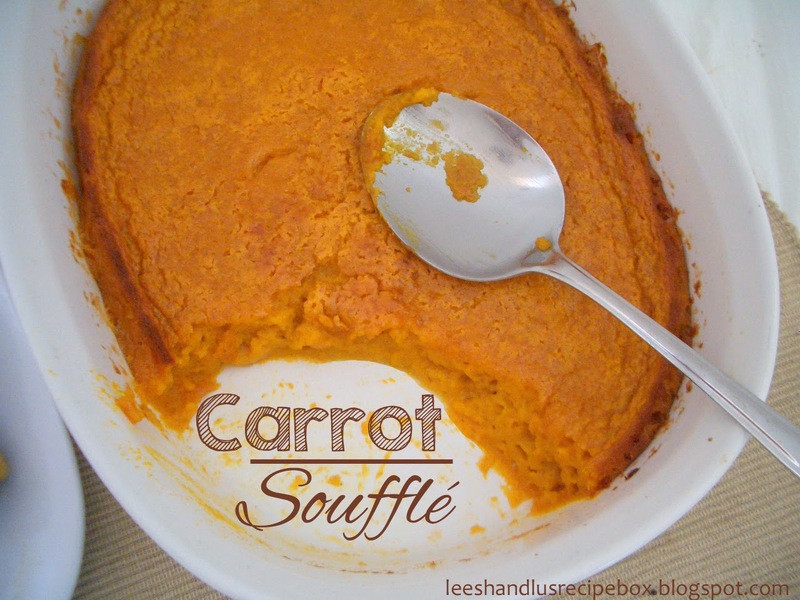 Cook/steam carrots or sweet potatoes until very tender, and mash. Measure out 2 cups and place in blender. Add the remaining ingredients to the blender and blender until mixture is smooth. Grease a 2 quart casserole dish (or 8x8 glass pan) with butter or non-stick cooking spray. Pour blended mixture into dish and bake for 45 minutes or until puffed and set. Double recipe for a 9x13 size casserole dish.